Have flute, will travel, and Toronto's BLOOD CEREMONY gets a lot of mileage out of the instrument on its self-titled debut album. A fascination with 70s occult rock — or "witch rock" in this case — that pays homage to acts like COVEN, AFFINITY, and BLACK WIDOW drives the vehicle, while the style clearly combines early BLACK SABBATH and JETHRO TULL. Riding the nostalgia wave for vintage sounds, led in many respects by WITCHCRAFT, BLOOD CEREMONY has carved a niche for itself, mainly because of the female pipes and flute work of Alia O'Brien. Her delivery is smooth and indeed witchy. The music is mostly in the slow (but not crawling) to mid-tempo range with the occasional up-tempo SABBATH shift with those circular ascending/descending riff patterns (e.g. "The Rare Lord" and "Return to Forever") and mixed with spooky organ and those dancing flute lines. Billy Anderson's mix offers a nice instrument separation, making the sound even more '70s-like. The free jam quality heard often in music of this type is present, but not boundless or meandering, meaning that the "jam" is always done in service to the song. 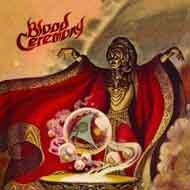 Those exclusively into this style of doom/stoner/psychelelic/'70s-style rock will find a lot to like on BLOOD CEREMONY's first shot across the bow. Those with a passing interest or looking for a change of pace should enjoy it too, though maybe not find it anything to rave about. The only problem to my ears is that the style begins to wear thing after you've heard the first few songs, as the album settles into a groove from which it never really veers. Maybe I should have lit candles and incense. The point should not be taken as a damning one though, as the music heard offers a certain freshness, even with its familiar sounds, and several righteously rockin' moments that will ring more than a few bells. Decent.